The Ekiti State governor-elect, Dr Kayode Fayemi has promised not to disappoint the people of the state who gave him the mandate in last Saturday governorship election. Fayemi gave this assurance on Wednesday shortly after he was presented with the Certificate of Return as the governor-elect by the Independent National Electoral Commission (INEC). 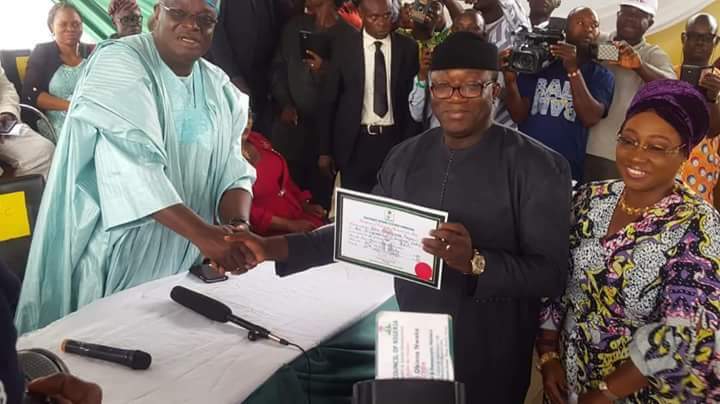 National Commissioner in charge of Oyo, Ekiti and Osun states, Prince Adedeji Soyebi, presented Fayemi with the Certificate of Return at a ceremony held at state INEC office in Ado-Ekiti, the state capital. Deputy governor-elect, Otunba Bisi Egbeyemi also received his Certificate of Return at the event. Speaking after he was presented with the certificate, Fayemi said the people of Ekiti state will enjoy the benefit of good governance as from October 16 when he takes over the reins of power.